It has been a while since I have read a Sophie Kinsella book, I absolutely adored the Shopaholic series and Can You Keep a Secret has to be my favourite by this author. 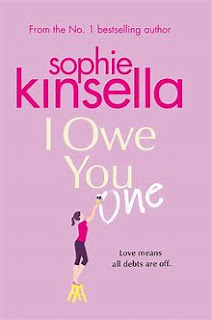 I did read Wedding Night when it was released but it didn’t quite have the charm and wit that I loved about the authors previous books so I was keen to read her new release I Owe You One to see if it would entertain me like her earlier novels. The main character in I Owe You is Fixie who true to her name can not leave anything undone and she goes out of her way to fix and help everything and everyone around her. It was whilst carrying out one of her good deeds, looking after a random man’s laptop in a coffee shop that she finds her self in a terrible mess but she fulfils her duty much to the utter relief and gratitude to the gentleman Seb he insists on paying her back. I enjoyed the back and forth payback that rolled between Seb and Fixie. Although there is romance flowing through the storyline I found I was more interested in watching Fixie grow in confidence! I did enjoy this book as a light easy read although I still feel like it lacked the wit and craziness that I loved with the authors earlier novels. I would still recommend this book but would just say it is more of a cosy romance than a modern, witty storyline that I would usually expect.